Out of 1.2 Bn Indians, only 150 million know how to understand English yet all our Healthcare information online is in English. Of the 1Bn native language speakers, 200 million people are already online and this number is expected to double in couple of years. However, important areas like Healthcare information is not in Indian languages. This enables quacks in smaller cities/villages to thrive as no one can verify their statements online. We want to change that and make Healthcare information easily accessible in native languages. We are starting with Hindi which is spoken by 400 million people in India. 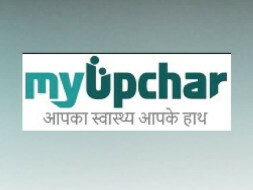 We have built a website, myUpchar.com for this sole purpose. It gets 750K visits/month. Overtime, we will make it a self sustainable venture with funds from advertisers who will be interested in reaching to the next billion people via our platform. We will also add tele-medicine service where a user can get accurate medical advise from any part of India for Rs. 30 - 50. We believe this is the only way we can make a huge impact in healthcare and enable access for entire India. = Rs. 102 lakhs. As we start to earn revenue, we can reinvest in scaling this initiative faster and reach out to a larger customer base. Both the founders returned to India after studying at prestigious Stanford University and working for global companies. Rajat - MS in EE, Stanford University, ex-Amazon. Manuj - PhD in Economics, Stanford University, ex-BCG. We are passionate about building a venture that impacts a large section of society while making sure that the venture is sustainable in future. We are looking for your support to get there.